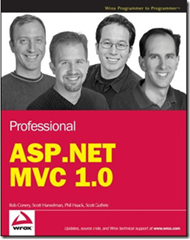 Over the last few months ScottGu has been helping to contribute to an ASP.NET MVC book that Scott Hanselman, Rob Conery, and Phil Haack have been writing for Wrox. The book is now in production, and will be available to buy in stores soon. He wrote the first chapter of the book – which is a 185 page end-to-end <input name="IL_MARKER" type="hidden">tutorial that walks-through building a small, but complete, ASP.NET MVC application from scratch. The agreement he made with Wrox was that he’d write it for free in return for them also making it available as a free PDF download. thanks manekeri, it will help me a lot. is there any more free ebooks available for asp.net and visual basic 2008? ?